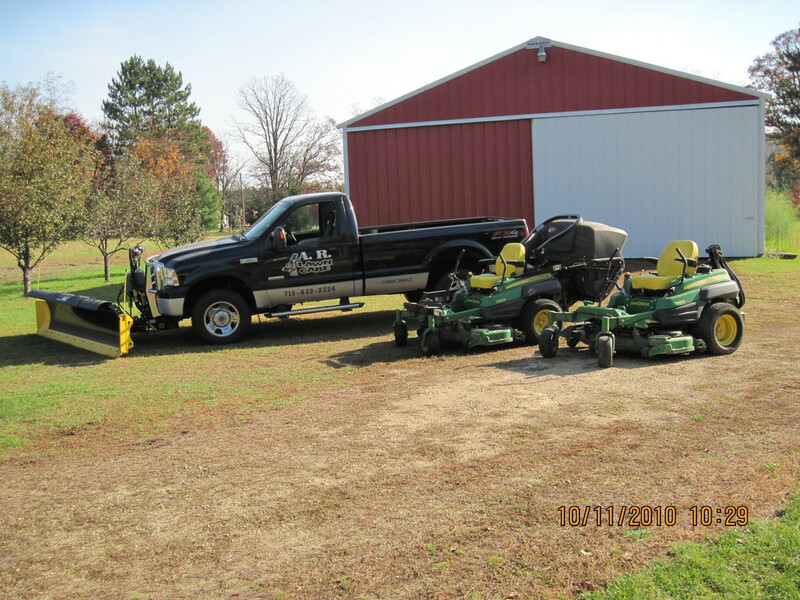 Lawns are mowed on a weekly /biweekly or as needed basis. Grass is cut and trimmed around lawn objects at a height of 3" to promote less weeds. The grass clippings are blown off with a back-pack blower from driveways and sidewalks leaving your area clean. We repair/replace sprinkler heads and adjust the watering timing for a healthier lawn. This is done at the customer's request. Now, what does a slit-seeder do? Well, we don’t want to make this more complicated than it really is, so, here’s the answer—a slit-seeder slits the soil and drops seeds into the slits it makes! The machine has a series of rotating knives that operate in the same fashion as a reel-type lawnmower. These knives cut into the soil forming narrow grooves, the depth of which is determined by adjusting the machine. The hardness of the soil, usually related to the moisture content, is also a factor in how deeply the knives will cut. A small hopper mounted on the machine is filled with grass seed that is dispersed onto the soil at a rate that is determined and adjusted by the machine’s user. We do some tree trimming such as overhanging tree limbs. Removal of trimmed branches is at the request of the customer only. When establishing, maintaining, or improving your lawn, do you understand the differences between, and the purposes of, the lawn aerator and the slit-seeder? What do these machines do, why do we need to use them, and when should we use one or the other or both? Let’s take a look at what your lawn needs in order to flourish, and then find out what these lawn maintenance machines do to help you help your lawn! Grass seeds need direct contact with a good growing medium (the soil), as well as sufficient moisture in order to germinate. But this is only the beginning—once the seeds germinate, the plant roots need continued feeding from the soil nutrients and other supplements in order to thrive. Ongoing moisture delivered to the growing root zone is also necessary. Many people think the purpose of the aerator is to simply poke holes into the surface of the ground over which you will then broadcast grass seeds. The seeds, they assume, will fall into the holes and later emerge as grass plants, sort of like digging a hole and inserting a bean seed into it in order to grow a bean plant. With lawns, this is not exactly how it works. Running over your lawn with an aerator actually serves multiple purposes. The most obvious ones are to help alleviate compaction of the soil, to allow moisture (either from rainfall or from irrigation sources) to better enter the soil, and to allow fertilizers and other plant supplements such as lime to better infiltrate and mix with the soil, and to feed the grass roots at a deeper level in order to encourage stronger and deeper development of the root system. Another purpose of aeration is to allow air to enter the soil to help carry out proper workings of bacteria that help break down organic matter on and in the soil. In this way, the grass clippings and the dead and dying grass plants or weeds and their roots will decompose and turn to humus which will actually feed the roots of the healthy lawn grasses. A sufficient amount of air is also necessary in order for the minerals in the soil to be transformed into forms that are usable by the grass plants. De-thatching is the process of removing dead grass which in turn allows new grass to germinate providing more growth and a fuller looking yard. We use a composted black dirt for lawn and garden reparation. We plow parking lots, driveways and sidewalks.